Cinders Goes Into Details of New Album and Touring Activity! Indie pop, alternative act Cinders have an all new album coming out soon enough titled "Looking Forward To Looking Back". After it's release, the band is set with intentions to play all over the place. Not having any plan on stopping at least not anytime soon! The band goes into much greater detail about themselves and this new album. Cinders is Jordan Zabriskie, Montana Smith, Adrian De La Cruz, Chelsey Powell, Austin Harris, and Brad Bennett. 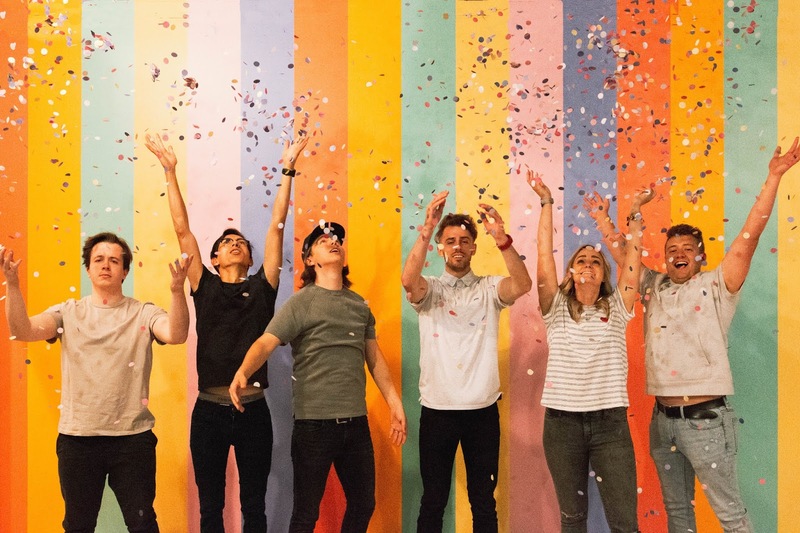 Formed in 2015, The rowdy-acoustic-pop group is attaining success across the United States, as well as continuously growing success internationally. We like to say that we were friends first and a band second. A few of us met in high school while others met later in life around different parts of the country. We all had a common passion for creating art, and we all have a desire to make something bigger than ourselves. With a shared love of music it wasn't difficult to to get Cinders started. There was a song that a few of the members had written together when they were teenagers called "Cinders". It wasn't a great song, but at the time it was really exciting to all be writing and playing music together. So when we decided we wanted to step into music as a career we thought it would be fitting to take on the name Cinders as a throw back to the first days jamming together. We are based out of Salt Lake City, Utah! The music scene here is definitely growing. There are a lot of awesome musicians by us that we have played with pretty often. Our current local favorite is Indigo Waves. They are just starting up and they are already killing it! I'm sure you will be hearing their name a lot more soon. Our favorite description we have heard is "rowdy-acoustic-pop". That pretty much sums up our genre! It is a good mix of pop melodies and driving alternative rock instrumentation. The acoustic presence adds to the character and personality of the music, and brings in a positive and energetic vibe. 5.What have you released so far and what can someone expect from your works? It has now been 2 years since the release of our self titled album and we are stoked to announce the release of our second record! Looking Forward to Looking Back will be streaming everywhere September 29th! This album has taken a good part of those 2 years to complete. It is much heavier instrumentally and lyrically than our previous release. It carries the same fun feeling and relatable element but in a but in a brand new way. Looking Forward to Looking Back and the 11 tracks on that album are all brand new songs that will be available everywhere on September 29th! We are always working on new music though and don't plan on keeping you waiting too long for even more new music. We will be on the road for the rest of this year touring the new album. We will primarily be on the West Coast this Fall and Winter, but in 2019 you can expect to see us around the rest of the country! We are excited about the journey of this album. We intend to tour the rest of the country and the world with it. We feel extremely blessed and thankful for where our music and work has brought us and we don't plan on stopping anytime soon! You can check out our website cindersmusic.com for physical copies of our records and other awesome merch! Our music is also available on all streaming services including Spotify and Apple Music. We just hope that they remember that as much as they like a song, it's way better if you have someone to enjoy it with. Looking Forward to Looking Back comes out September 29th! Make sure to follow on Spotify and Apple Music so that you can hear it first!